Admitted to M.A. degree January 1986. Subjects taught: Trusts; Mercantile Law; Land Law; Personal Property. 2004-2008: Judge in charge of the Construction and Arbitration List. 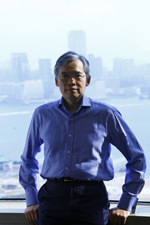 2008-2012: Judge in charge of the Admiralty and Commercial Lists respectively. Taught course on Selected Issues in Commercial Legal Practice with Prof. Lusina Ho. Second Semester 2005-6. May 2006. Lecture on Sir Thomas Strange (Chief Justice of Madras 1801-16) and the Development of Anglo-Hindu Law. Lecture series on Civil Procedure under Civil Justice Reform. Delivered 6 one-hour lectures between February and April 2009 on Civil Justice Reform. Judicial Training Seminar on Management and Adjudication of Construction Litigation: 15-16 April 2009. Spoke on case management and arbitration in relation to construction disputes. Taught course on Topics in English and European Legal History with Mr. Alfred Cheng. Second Semester 2009-10. Lecture series on The Sale of Goods. Delivered 5 two-hour lectures on the Sale of Goods (including the Carriage of Goods by Sea). Lecture series on How To Be An Arbitrator: A Personal View. Delivered 5 two-hour lectures between January and February 2012 on Arbitration. Book review. Sir Orby Mootham, The East India Company's Sadar Courts: 1801 - 1834. Cambridge Law Journal 311. Book review. MacKenzie and Phillips, A Practical Approach to Land Law. (1987) 17 Hong Kong Law Journal 269. Case note. Conflict of Laws. "The ADHIGUNA MERANTI". (1988) 18 Hong Kong Law Journal 141. Chapter. "Shipping Law" in Halkyard and Smart (eds. ), Trade and Investment Law in Hong Kong (Butterworths Asia: 1993). Book review. Byrnes, Chan and Edwards (eds. ), Hong Kong Public Law Reports Vol.1: 1991. (1994) 24 Hong Kong Law Journal 152. Address. "On Two Suggested Alternatives to the Rule in Hadley v. Baxendale". (2008) 38 Hong Kong Law Journal 347. Book review. Cameron and Kelly, Principles and Practice of Civil Procedure in Hong Kong. (2009) 28 Civil Justice Quarterly 159. Address. "From Uncommon Asian Laws to a Ius Commune" (2010) 40 Hong Kong Law Journal 805. Article. "The application of Hong Kong equitable remedies to contracts governed by Mainland law", Trusts & Trustees (2014) 20 (4): 325-334. Article. "ASEAN and the Hague Conventions", (2014) 22 Asia Pacific Law Review 25. Address. "The Future of the Judiciary: Reflections on Present Challenges to the Administration of Justice in Hong Kong", (2014) 44 Hong Kong Law Journal 429. Article. "The Hague Conference on Private International Law in the Asia Pacific", (2015) 114(1) Kokusaiho Gaiko Zassi (Journal of International Law and Diplomacy) 27.